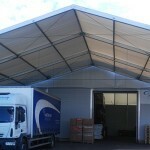 Temporary Transport and Logistic Structures - Bees Marquee Hire - Wedding, Parties and Corporate Events. 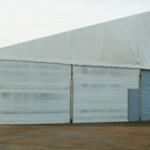 Our temporary buildings offer the ideal solution for logistical or transport-based operations, including airports, dockyards, rail terminals or redistribution centres. Structures can be linked together, allowing easy fleet access for even the largest articulated goods vehicles. Industrial lighting and heating can be installed to ensure 24-hour operations. Brief: to provide a temporary warehouse, for 2-3 years, while client had a new, permanent warehouse and production plant built: no interruption in trading. Light goods vehicles needed easy access on site, and three separate zones were requested, within the structure, for pre-production, product storage, and vehicle loading. 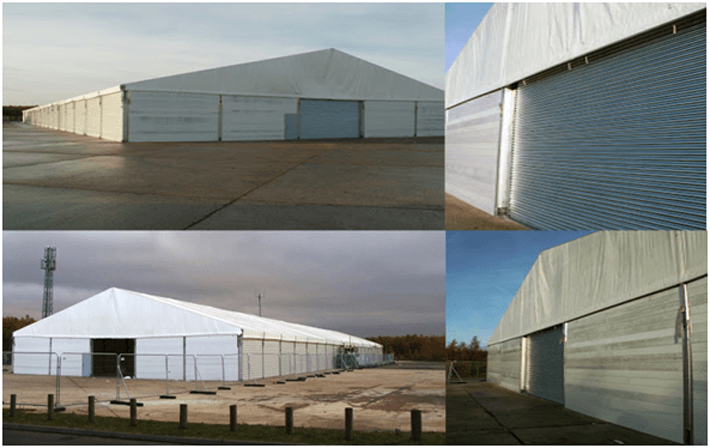 >Bees’ Solution: a 25m x 95m span frame structure, with; cladded PVC panel sides, PVC roof, partitions and doors between zones, and full-height metal roller doors for vehicle access.